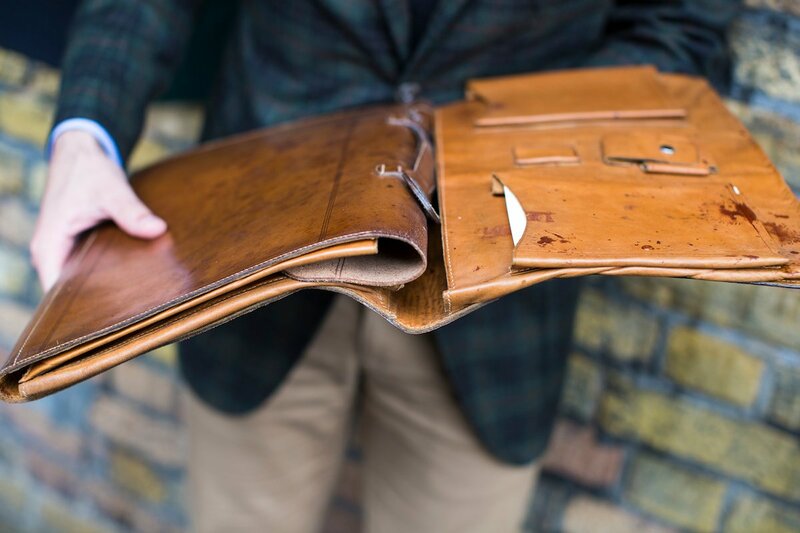 I bought this vintage folio from Bentleys Antiques in London last year, and it has proved fantastically useful. We can all count ourselves lucky that laptops (well, MacBooks anyway) are only a touch bigger than European writing paper in the first half of the twentieth century. It means vintage cases like this one can still be used today. Along with the MacBook Air I tend to carry a phone, wallet, keys, business cards, phone and notebook. Plus assorted papers. This case can hold all of them, with several of the pockets also conveniently sized. The biggest problem with vintage cases is speed of access. 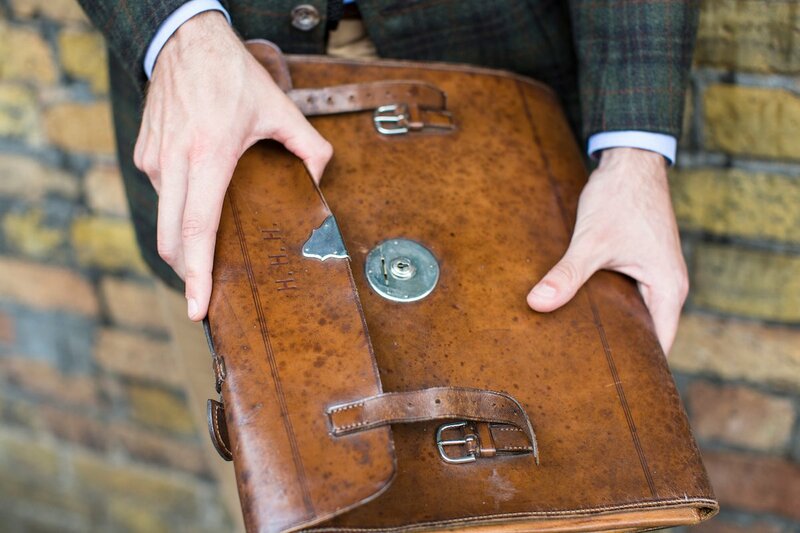 A gentleman in the 1920s never had to dive into his case to answer a call, fish out his wallet or drop in a leaflet. He would arrive, sit, and only then open his case. Pieces like this would usually contain writing equipment, which would always require a desk. Modern cases usually have some form of external pocket, and it is often the one most heavily used. The classic attache case suffers from the same problem – it has to laid down on a surface to access the contents, which is not helpful when you are trying to dig out a map or grab your keys. However, for a vintage piece this folio is actually quite easy to use. It can be opened at the top when held, as shown, giving access to a deep, full-width pocket. It is here that quick-access items can be stored, while the laptop and anything else can be contained in the other two, folded sections. The leather is a heavily waxed calf on the outside, and goatskin on the inside. It has a lot of spotting on the exterior, but I like such signs of age if they don’t affect the functionality. If I could change one element, it would be the hardware, which might be nicer in brass. 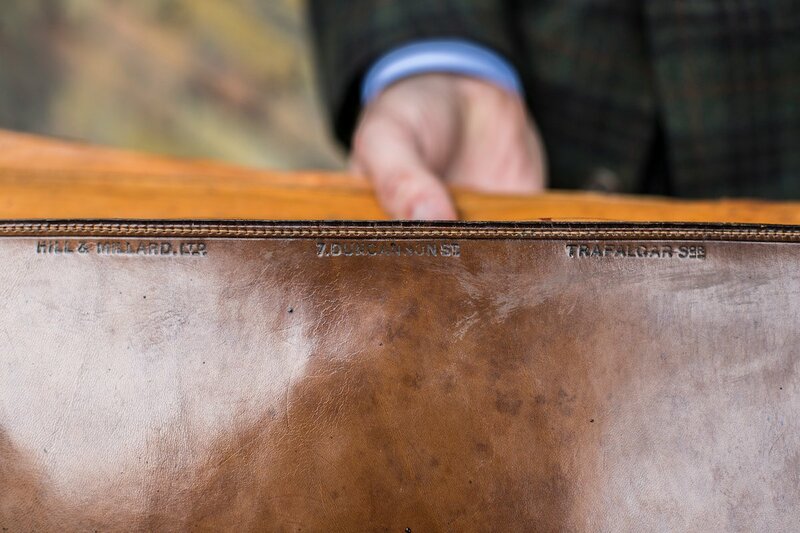 You can follow the discussion on My vintage leather folio by entering your email address in the box below. You will then receive an email every time a new comment is added. These will also contain a link to a page where you can stop the alerts, and remove all of your related data from the site. You’d think a bespoke jacket would have a pocket or two for phone and such……. They do of course, but I would always rather avoid carrying such things in my jacket. Not great for the line of the thing. Usually it’s a phone at the most. Do you carry your phone in your pocket, then? That really is a lovely, lovely piece of kit. Sorry Simon, a question on a different topic – I noticed that your dinner jacket (made by Richard Anderson) has no facing on the lapels. Is this correct? Is this in keeping with tradition? Have you tried to follow up on the wording to see if it has any real history? Perhaps it’s Hunter Hearst Helmsley? On the subject of your dinner suit: what kind of braids do you have on the trousers? Same silk as the lapel? If so, do you have it attached at the seem, or as a strip covering the seam? Thanks. Did the tailor make the strip himself from the silk used for the facing or was it supplied as a strip from a trimming supplier? Russel at GB told me that you need a special sewing machine to make a silk strip straight. Loving the jacket’s pattern. The material is Cashmere? Really nice piece that Simon – Tim always has some lovely things and we have chewed the fat over many an article in the past. Why does there appear to be a blood-like spattering on the right side of the folio on picture 4 which is missing from picture 5? Out of interest, how do you care for the leather of the folio? 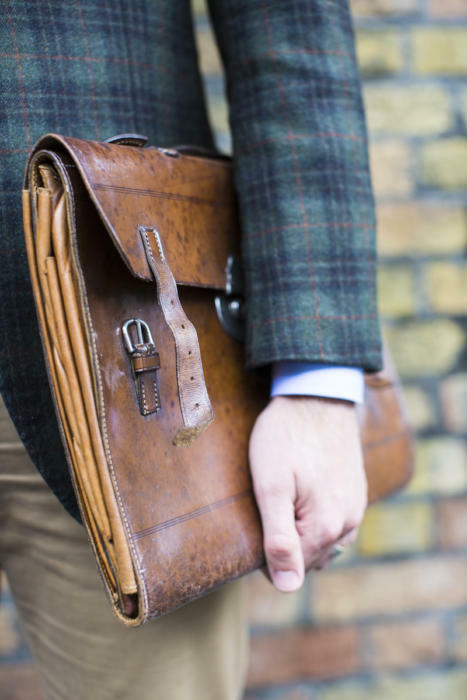 I have a similarly old leather satchel that I use instead of a laptop bag and I want to make sure I look after the leather properly, as it has lots more character than a black nylon shoulder bag. Lovely piece Simon, thank you. 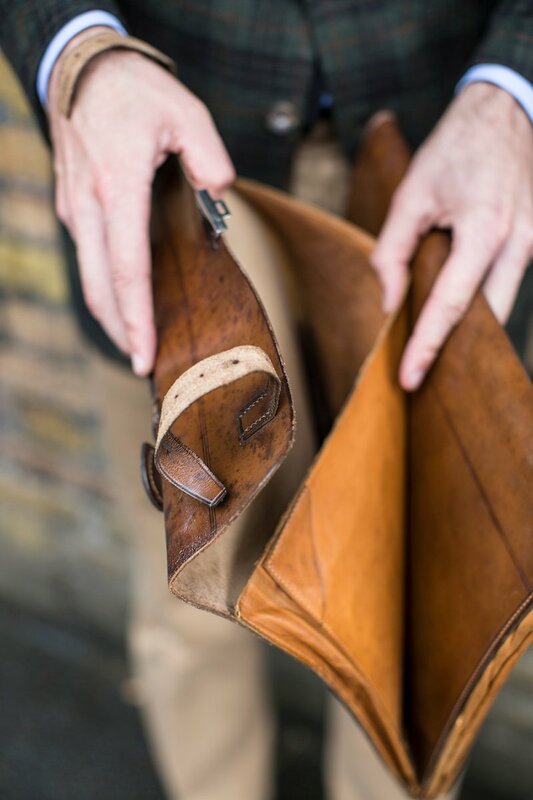 I feel the world of modern leather goods is yet to effectively address the challenges technology pose. I have a small messenger from The Bridge with a useful outer pocket, but I still struggle to locate things within it. I would love you to explore this in more detail in future posts, thanks again. 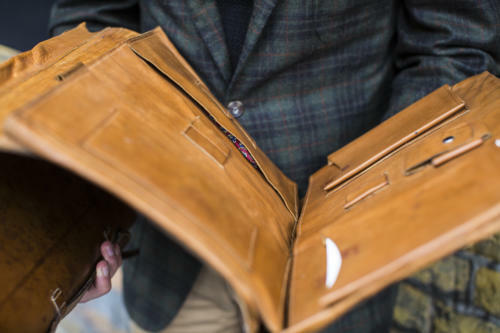 I am wondering if there is any chance you would be willing to add a photo or two of the inside of the folio when it is completely opened up? It would be lovely to see the complete layout of all the pockets and pouches, and speculate as to their exact purpose back in the day. Simon, I would like to know how to look after Bridle leather goods. I’m in the process of looking to buy a Swiane Adeney Brigg legal attache case. Since the cost of these finely made cases are high my concern is how to I protect from cracking and dry out. This would also apply to small Bridle leather goods as well.